In a crumbling colonial mansion besieged by slums in the old quarter of Algiers, Lamia lives a life of self-imposed isolation, communing only with her ghosts by day, working as a paediatrician by day. Her family are dead, but for her beloved brother Sofiane, who has become a harraga – one of those who risk their lives attempting to flee the country for a better life in Europe/elsewhere. Lamia's tranquil, ordered existence is turned upside-down when a sixteen-year-old stranger knocks on her door in the middle of the night. Only because she has been sent by Sofiane, Lamia takes the girl in. Pregnant, unmarried and dressed in garish finery like an X-Factor contestant, Chérifa is talkative, curiously innocent, and utterly unafraid. She enters the house like a whirlwind, and leaves a trail of destruction in her wake. Lamia must try to teach her, to protect her against a world where a woman who is not meek, subservient, married is an affront, where a girl who is pregnant can be killed to spare her family's honour. 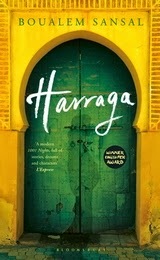 By turns funny and lyrical, luminous and sardonic, Harraga, by the controversial author of An Unfinished Business, is the engaging and ultimately tragic story of two very different women who become friends and allies in a patriarchal world. 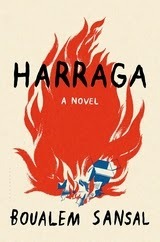 Harraga will be published in the States January 2015.